An important part of the implementation of Common Core State Standards (CCSS) is that it will change the way that students are assessed. Prior to the Common Core, each state had its own assessment system. Now, many states are participating in one of two state consortia that address testing. 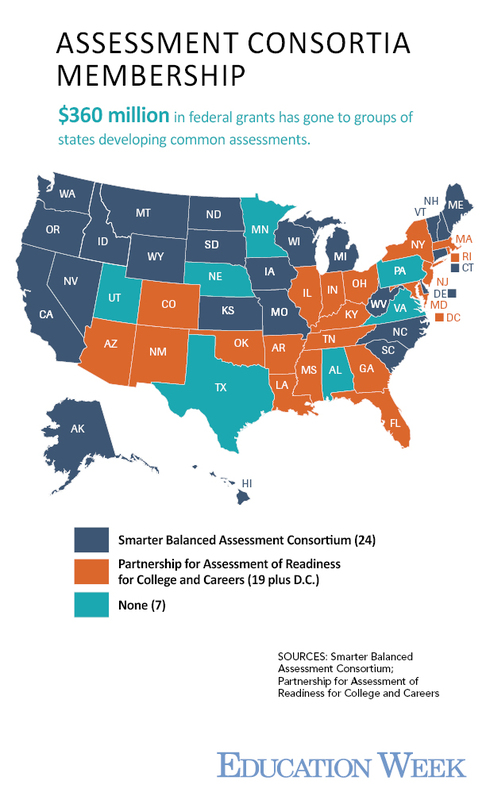 States may be a member of either the Partnership for Assessment of Readiness for College and Careers (PARCC) or Smarter Balanced Assessment Consortium (SBAC). Some states have chosen to drop out of their consortium and these states will contract with testing providers to create their state assessments. The map below shows which states are participating in PARCC and SBAC-please note that it was created in July 2013 and may not reflect some of the most recent states (such as Florida) that have dropped out of a consortium. A state may belong to a consortium as either a “governing” state or a “participating” state, which determines the strength of decision making that a state has in the consortium. A “participating” state does not have a say in major decision making, while a “governing” state has voting power and a voice in assessment design, cost, field testing, etc. Arkansas is a governing state for PARCC, so it has been closely involved in the development of computerized exams which will assess students on CCSS, replacing the Benchmarks and End-of-Course Exams. Some Arkansas schools will participate in PARCC pilot testing in spring 2014, and all AR schools will use the tests next year. Now, for more specific details about the tests. 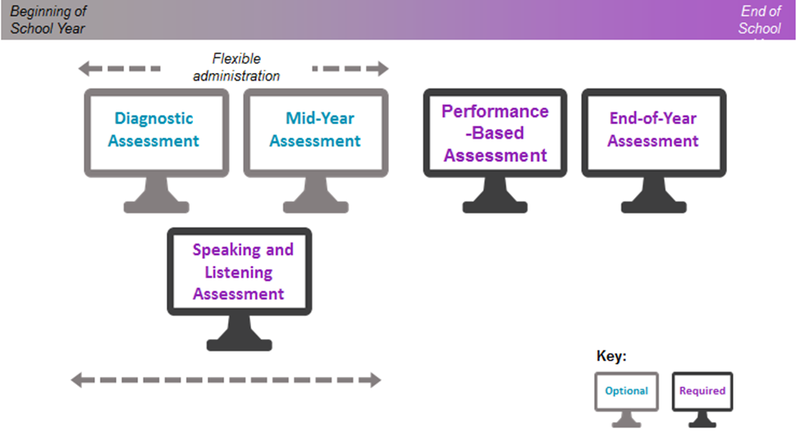 As this model shows, required assessments include the Performance-Based Assessment (taken after 75% of the school year is complete and consists of extended tasks and applications of concepts and skills), the End-of-Year Assessment (taken after 90% of the school year is complete and consists of short-answer, “innovative” items), and the Speaking and Listening Assessment. All assessments in blue are optional, but highly recommended by PARCC. Schools will have a maximum of 20 school days to administer the Performance Based Assessment and the same amount to administer the End of Year Assessment component. The models below show a breakdown of how the Performance-Based Component and End-of-Year Components will be administered. At each grade level, the Performance-Based Component will require five sessions – three sessions for ELA/Literacy and two sessions for mathematics. TheEnd-of-Year component at each grade level will require four sessions – two sessions for ELA/Literacy and two sessions for mathematics. In the example provided below for 4-5th grade, the total of testing is 9 hours 20 minutes. This is similar to the amount of time that Benchmark Exams require. Next is a table of each grade level’s estimated total hours spent testing, which includes the Performance-Based and End-of-Year assessments, but not the required Speaking and Listening assessment, which will be administered by individual teachers. 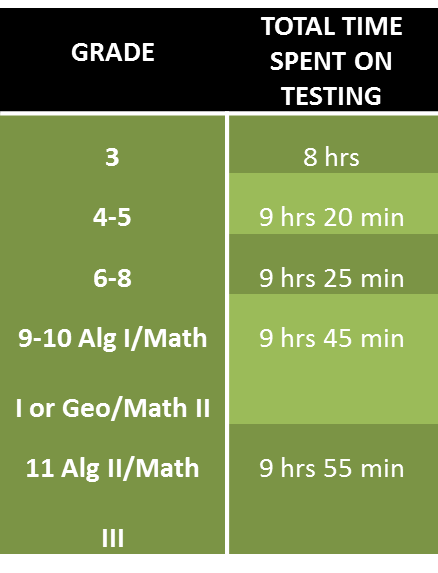 While it is believed that most students will complete the tests within these estimated times, all students will have a set amount of additional time for each session to that will give them extra time to complete the session. More guidance will be provided later in the year as to how these amounts of time will be determined, but students who have this accommodation written into their IEP’s will certainly be granted extra time to complete their assessments. So, what will the test look like? 1) Some Computer Literacy Required: First, students will need to be able to type from 3rd grade on. This requires teaching of computer skills younger than 3rd grade and this has raised some concerns about technology availability in many districts, as well as concerns about when it is developmentally appropriate to begin keyboarding instruction. Beyond keyboarding, students need to be able to manipulate a mouse, navigate between test questions with arrows, scroll down on a page, click, drag and type answers on a keyboard. By high school, they need to be able to select an answer choice from drop-down boxes. 3) Prose Constructed Response: Students as young as 3rd grade will write an essay inside a text box with functions similar to Microsoft Word. In fact, 3rd graders will be asked to write three short pieces, according to Laura Slover, who heads one of the consortia that are building the tests. They will read a nonfiction selection and a literary passage and write about each, and they will be asked to write a story based on a real or imaginary experience. 4) Includes Videos: In 6th-8th grades, students are asked to watch a video and answer questions. 5) Multi-part Questions: In high school, students are asked to solve several multi-part questions. For example, they solve a word problem and enter their answer, then graph a corresponding linear function (the student selects two points on the coordinate plane and then a line containing the two points will be automatically drawn.) Additionally, high school students are asked to combine math and literacy, by justifying their answers through writing in a text box. 6) Multiple Choice is Not Dead: There are still quite a few questions that require students to read a passage and then answer multiple choice questions, although some questions offer as many as five or six choices to choose from (A-F). 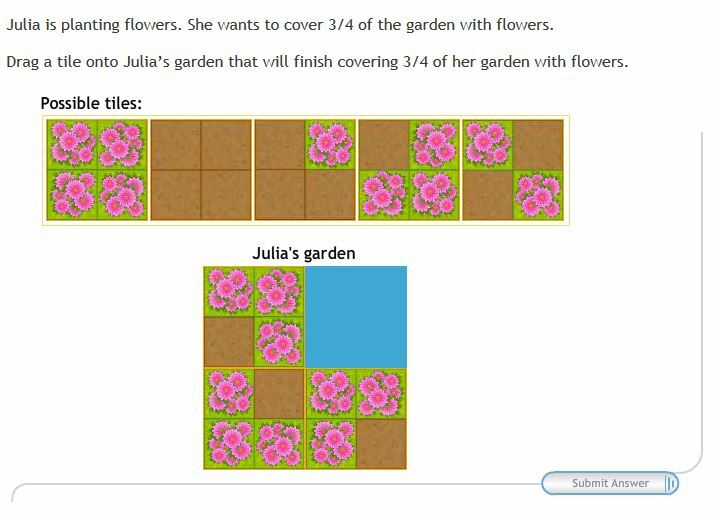 7) PARCC is not computer-adaptive: A new feature of Smarter Balanced (but not PARCC) is that tests are computer-adaptive, meaning the test adapts its questions based on the students’ ability to answer questions (question will either increase or decrease in difficulty). An example of a computer-adaptive test is the GRE (Graduate Record Exam). PARCC, on the other hand, will be computer-based but will not be “computer-adaptive” — all students taking the same exams will see the same items. 8) New Listening and Speaking Assessment: This is a new test that will be developed by PARCC for grades 3-11. PARCC has indicated that this test will be teacher-scored using a common rubric and results will not be included in a student’s summative score. Results will also not be included in states’ accountability systems. How big of a challenge is the technological infrastructure piece? The short answer to this question is: It’s a pretty big deal. However, paper-and-pencil tests will be an option in worst-case scenario situations. States must have a technological infrastructure in place by 2014-15 to participate in these exams. One benefit to this approach is that it will encourage schools to improve their technology, which is likely to have potential benefits for students all year long, not just during the testing period. Indeed, the inability to administer tests online was cited by Oklahoma as one of its reasons to withdraw from the PARCC consortium. The bad news for Arkansas is that TechNet’s 2012 Broadband Index listed Arkansas last in the country (even behind Alaska) for broadband access. 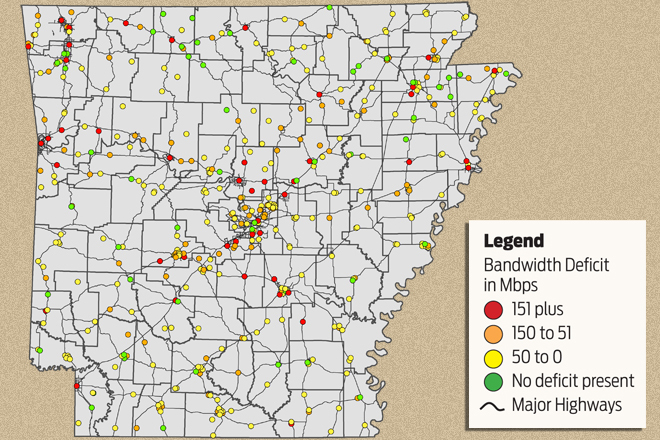 In August 2013, the ADE surveyed districts across Arkansas in terms of their broadband capabilities, setting a broadband capacity threshold of 100 kilobits per second per student, an amount that may be required for the high-bandwidth option for PARCC assessments, though a lower amount of 30 kilobits per second per student may be acceptable as well. Current data from ADE suggests that up to 90% of Arkansas Public Schools do not have enough broadband to meet the recommendations. This map shows which K-12 Schools are operating at bandwidth speeds of 100 megabits per second for every 1,000 students and staff members. Each dot represents a public school acting as a bandwidth distribution point for nearby educational facilities. However, the ADE believes that the majority of schools will have sufficient bandwidth to administer the PARCC assessments for 2014-15. This is due to evidence that students will be able to take the test even if their schools do not have optimum bandwidth. Adrienne Gardner, vice president of STEM education at the Arkansas Science & Technology Authority and a member of the Gov. Beebe’s Quality Digital Learning Study committee, said the ADE has been investigating low-bandwidth options for administering PARCC and believes most schools would have sufficient broadband access to take advantage of the alternative options. A paper and pencil version of the assessment will also be available. PARCC has been a bit vague on this topic, but this may be understandable due to field testing that is yet to be completed. 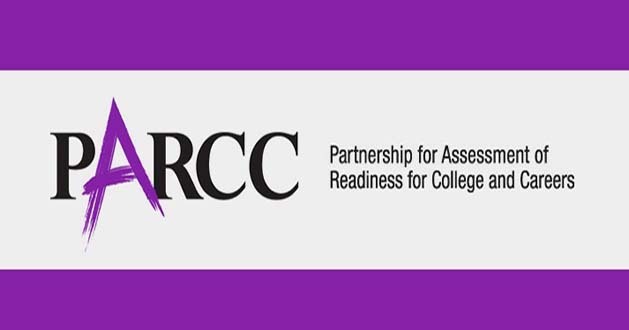 According to PARCC’s website, “PARCC tests will yield results in a timely manner rather than requiring students and teachers to wait months or well into the next school year for results.” PARCC’s goal is to have data from the performance-based assessment returned before the end of the school year. It is important to note that they are machine-scorable portions of the assessments, but there will also be hand scored responses. PARCC’s website states that “it’s time to retire the old pencil-and-paper bubble tests” in favor of online tools to which students can better relate. PARCC asserts that the computer-based assessments will be much more interactive and engaging. For the first time, states participating in PARCC assessments will be able to compare their results to each other. The Smarter Balanced test will be a bit different, but will also be aligned to CCSS. Other states are not participating in either consortia, but will have testing aligned to CCSS. Thus, it is conceivable that, in the future, comparisons could be made with non-PARCC states, although it’s not immediately clear how valuable these comparisons will be. In sum, CCSS and the test consortia will not facilitate national comparisons, but they will make state-to-state comparisons easier than they were before. 250 AR districts were selected to participate in Round 1 of the PARCC Field Test and all but 6 districts agreed to field test at least one sample, which is a 97.6% AR district participation rate. 56 AR districts volunteered for additional PARCC field testing. 20 AR districts were selected to participate in Round 2. All but 1 district agreed to field test at least one sample, which is 95% AR district participation. In December 2013, districts received a letter from Pearson listing their Field Test samples. Computer-based practice tests are available to all schools (whether field testing or not) at no cost. PARCC will bring many changes to the way that Arkansas assesses students, which will require that adjustments be made by school administration, technology staff, teachers and students. 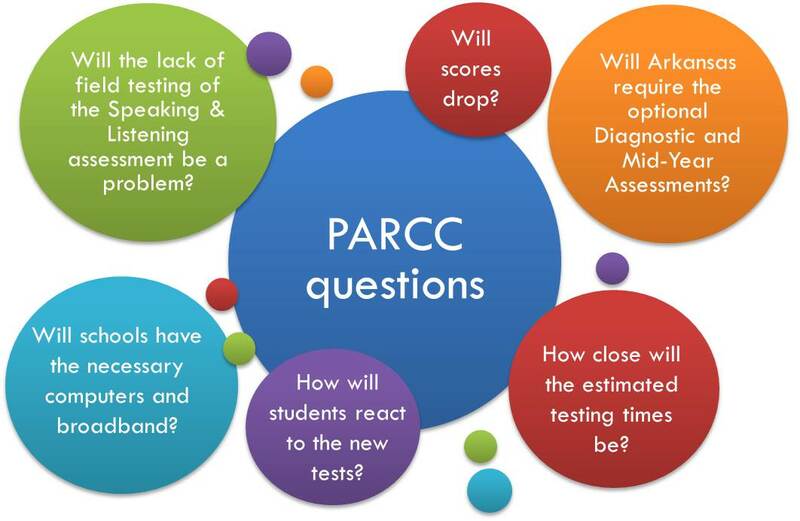 This graphic illustrates some of the questions that we at the OEP have about PARCC, which may be partially answered through the field testing process. We hope that this update on PARCC has been useful and hope the Arkansas field testing goes well!